In theatre, travesti (meaning "disguised") is a character performed by a person of the opposite gender. A woman performing as a male in male clothing is called a breeches role. 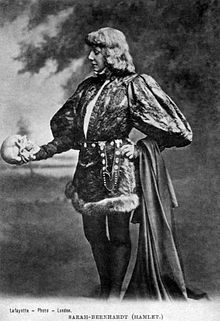 Famous travesty roles in opera include Cherubino in The Marriage of Figaro, Siebel in Faust, and Octavian in Der Rosenkavalier. In ballet, the role of Frantz in Coppélia was a travesty role at the Paris Opéra until the 1950s. Carabosse in Tchaikovsky's ballet The Sleeping Beauty is performed by a man in woman's clothing. The Stepsisters in Prokofiev's ballet Cinderella are sometimes played by men in women's clothing. The title character is a travesty role in the Broadway musical Peter Pan. This page was last changed on 13 September 2013, at 07:04.